Please refer to our stock # 10719 when inquiring. Oil on Academy Board, signed and dated "(18)88", dated "Dec. 27,1888" on the reverse and titled by Benson B. Moore also on the reverse. Provenance: The Washington area painter Benson B. Moore. Moore studied with Weyl at the Corcoran in Washington D.C.
Painting: 11 x 16 in. Frame: 16 x 21 in. ** For other paintings by artists from Maryland, Virginia, Washington DC or North Carolina, click on the “Regional Artists” button on our Homepage. Max Weyl was born Dec. 1, 1837, in Germany and immigrated with his family to Williamsport, PA in 1853. At this time and after his arrival in Washington, DC in 1861, Weyl earned his living as an itinerant watch repairman. At the relatively young age of 24, he had saved enough money to open his own jewelry shop at Third Street and Pennsylvania Avenue. He was self-taught as an artist but was encouraged in the field by Washington artist Charles Lanman, who recognized his potential artistic talent. In 1870, Weyl sold his first painting to Samuel H. Kauffman, publisher of the Star . Kauffman became a regular patron of Weyl. By 1878, he had achieved sufficient success to list himself as an artist in the city directory and had devoted himself full-time to his art. 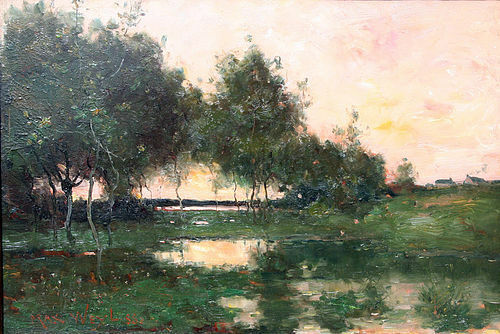 A year abroad in 1879-80, visiting and studying in Paris, Vienna, Munich and Venice attached him to the Barbizon style and gave him his nickname of the "American Daubigny". His first exhibition and sale of landscapes was in 1879. Eventually, his landscapes of the Potomac River and Rock Creek Park won him much recognition and acclaim. During the years of 1882-92, he shared a studio with Richard Norris Brooke in Vernon Row at 10th and Pennsylvania, moving to the "Barbizon Studio" building, on 17th and Pennsylvania, from 1892-1903. Weyl had annual exhibitions and sales at V.G. Fischer Galleries. There was a retrospective at the Corcoran Gallery of Art in 1907. Weyl died July 6, 1914, in Washington, DC. Today his work can be seen in such varied locations of the Corcoran Gallery, the Cosmos Club in Washington, the National Trust for Historic Preservation and Virginia Military Academy. Falk, Peter, ed. "Who Was Who in American Art 1564-1975"
** For other paintings by artists from Maryland, Virginia or Washington DC, type “local” into the search box.